Now available on the Silhouette America online store is the first of a monthly series of "mini quilt" designs based on the popular "On the Docket" patterns by Hearthsewn. 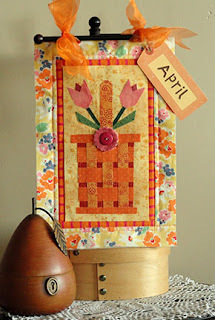 April's design features a layered tulips basket, with woven basket reed strips, 3-part button, paper binding edge strips and letter-cutout "name" tag. The finished size design is approx. 7x10, but of course you can re-size to your own preferences. If you decide to create a "quilt" for each month, there are several ways to display them that offer convenience for changing with each new month. Here, the paper version is clipped to a wire mesh frame. A tutorial for creating your own display frame follows on this blog. Here is a fabric version - a more conventional mini-quilt - enlarged at 134%. It is displayed with attached sheer ribbons to a counter-top towel holder from Bed Bath & Beyond (find this product here). Edge treatment of my fabric quilt will be completed later, using traditional fabric binding. In place of the cut-out button, I substituted a regular colorful button at the handle hinge. The fabric shapes were cut on my Silhouette Cameo using their fabric interfacing. The layers were assembled and "fused" with a hot iron, according to the product directions. 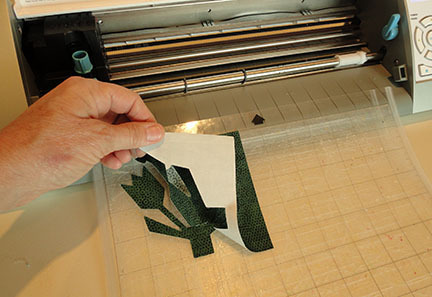 If you do not plan to stitch over the cut edges of the applique shapes, use "clean cut" interfacing which has a thicker layer of fusing adhesive to keep fabric edges from fraying. 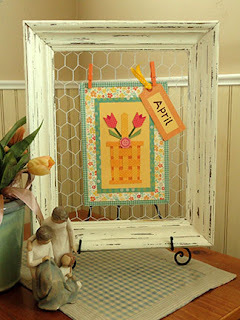 Check the May On the Docket blog post (to follow at a later date) for two more ways to display your finished paper or fabric On the Docket quilt. so pretty and thanks for the helpful hints about using the fabric interfacing! Can this design be used as a paper quilt card--A2 or 5 x 7? The Docket paper quilt series of designs is oversize for even 5x7 cards, but you could try to reduce them to the size you wish, using your Silhouette Studio or other digital cutting tool software. Just take care for some of the smaller, finer shapes that might get too delicate is sized down. Incidentally, there is a bi-fold card using this design in the Silhouette America online store already. Design no. 42763 card-tulip trifold.